I am excited to announce to all of you my next project. 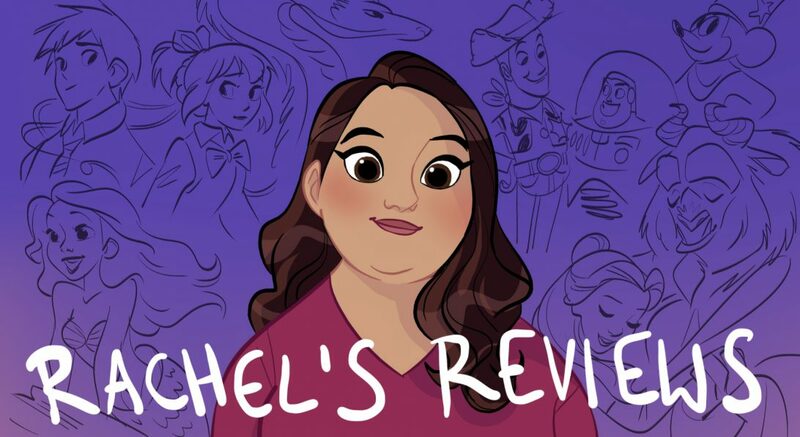 Consider it my Christmas gift to all of you wonderful readers. I have always loved Charles Dicken’s Christmas Carol. I see it at our local theater, Hale Center Theater Orem, every year and watch as many film versions as I can. This year I figured let’s hunt down some more unusual one’s, as well as the favorites and blog about it. This should cover everything from silent movies to animation to Muppets. I’m really excited!! I won’t go through the basic plot for each review because they are all basically the same, but I will note different choices in each version, talk about the leads and each strength and weakness. 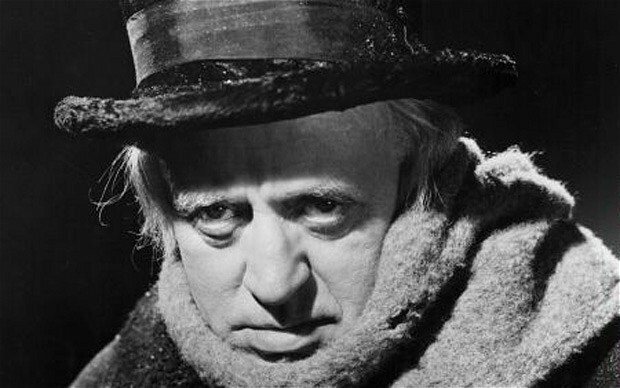 If you live under a rock and don’t know the story of A Christmas Carol it is about a Victorian banker named Ebeneezer Scrooge who has allowed his heart to grow hard over a fear of poverty. Dickens father was sent to debtor’s prison and it was a great fear of his and all of the Victorian era. You can get a real sense of this gloom in his novel Little Dorrit (if you like Christmas Carol I highly recommend reading it). Scrooge has allowed himself to turn fear into coldness towards his fellow humans. This is demonstrated through his hatred and disgust of Christmas. He has a beleaguered clerk Bob Cratchit who remains positive despite everything. Bob has a son named Tiny Tim who is on crutches and in failing health. Scrooge also has a nephew of a sister who died in childbirth. Seeing his cheerful nephew is painful for Scrooge because of his sister’s memory. It is another event that has made him bitter and cold. One Christmas Eve Scrooge gets a visit from his departed partner Jacob Marley. Jacob was selfish and cold like Scrooge but he feels sorry for his friend and arranges a way for him to be rescued from purgatory. 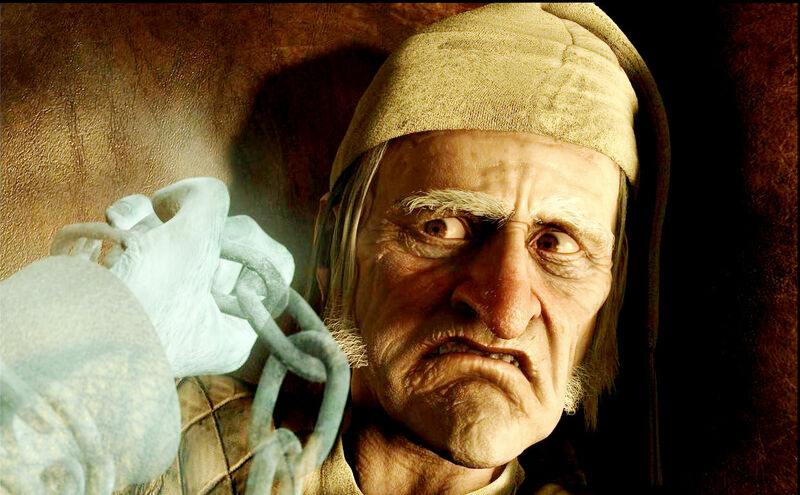 Scrooge will have to be visited by 3 spirits- the ghost of Christmas past, present and future. Through seeing his past and what made him bitter, the present and what he should be grateful for, and the future that is to be dreaded, Scrooge is humbled and decides to change and embrace Christmas and joy in life. Honestly I’ve yet to see a version of this story that I haven’t liked on some level. It just moves me (yes even Smurfs and Tori Spelling…). I love the story because it is about seemingly lost causes and the fact there aren’t any. Everyone has potential for redemption and hope. I personally see that redemption through Jesus and His great gift at Christmas but even if you are not Christian the message of hope in Christmas Carol is something to share and never forget. So consider this my gift to all of you and my attempt to spread some hope during the holidays! I am not sure what order I am going to do the posts or how I will group them but here are the films I plan on taking a look at over the next month. It will probably depend on how soon I am able to get a hold of different versions. I’d love to hear your favorites! 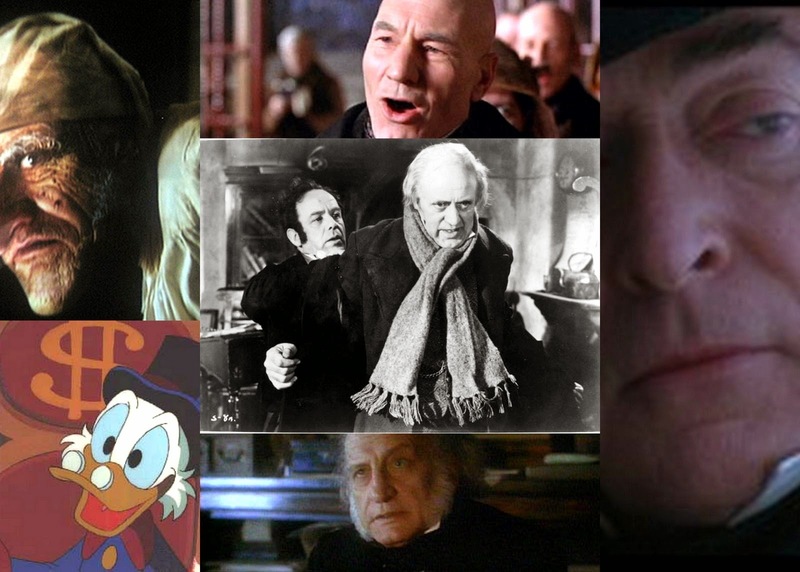 I am excited to announce on my movie blog site I am going to be starting Scrooge Month! 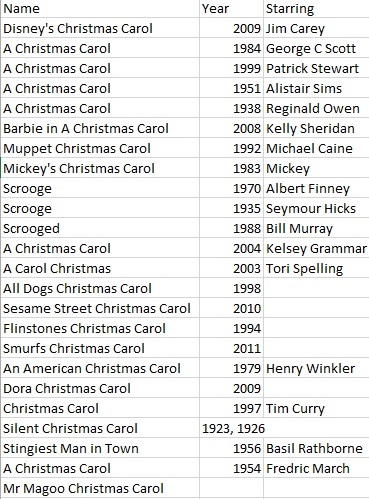 As my gift to all of you for the holidays I am going to be reviewing as many versions of Christmas Carol as I can. Merry Christmas and Bah Humbug! Scott (1984) and Mickey’s Christmas Charol (1983). Those your favorites? They are great! Yep, I think they hit the core of the story the best. My favorites going into this are probably Alistair Sims and Muppets but I love Mickey and George C Scott too. I don’t think I’m going to give grades on these. I’m just going to note the differences and similarities, weaknesses and strengths and enjoy them. I’m excited to see the more obscure one’s like the silent films. Should be fun. Merry Christmas! Seems like an awesome project 😛 ! Looking forward to reading these reviews! I already said somewhere else that my favourites are the Muppet version and the Patrick Stewart version – I always try to watch both every Christmas. Those are great versions! Look forward to your comments and feedback. Thanks in advance for reading. The Muppets actually has a ton of the original book in it especially for a light kids movie. It’s probably my favorite Christmas Carol musical. He really is such a light and joyous character. I was babysitting some kids of a friend in the ward and I put on Mickey and was amazed at how they instantly lit up at his voice. He is kind of like Elmo in that way. He just means love. Wow, I didn’t realize there were THAT many versions of it made! I do enjoy it in general, and I’ll look forward to your reviews!